Before dropping hundreds at the local golf shop, consider the equipment that Brandt Snedeker used to win the AT&T Pebble Beach National Pro-Am on Sunday. And a 4-year-old set of irons. His Bridgestone J40 irons are well-worn, as is his Odyssey White Hot XG Rossie, which Snedeker first discovered in 2005 on the Web.com Tour. It’s been in play since the ’06 season. Golf Digest crunched some numbers. 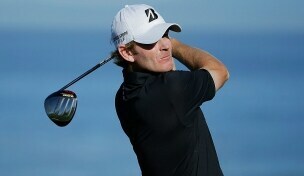 The current trade-in value for Snedeker’s driver and putter: a whopping $34. Heck, those clubs aren't old. Heck, those clubs aren't old. Just take a look at the WITB of Bernhard Langer! His 3, 4 & 5 iron are 1992 model Hogan Apex! the resale value on good quality snow boots is higher. How crazy is that...used boots sell for $50+ a pair. True Aimee. I've sold things on ebay for more than his clubs are worth! But if you hit them well, why switch? He's clearly making bank with those clubs so stick with them! I've sold things on ebay for more than his clubs are worth! But if you hit them well, why switch? He's clearly making bank with those clubs so stick with them! There was a discussion on another board about the true value of Snedeker's clubs, his driver in particular. He's playing a TP version of the old Burner Superfast in 8.5° which was a very rare head only found in tour vans generally. Couple that head with the high end shaft that he's playing and you've got a driver worth a whole lot more than the typical secondhand retail version of a Burner Superfast that is bringing $35. It's no wonder he said that if he could find a few more just like the one he has he would buy them all for the price quoted in the article. What you say about trade in value being fixed is ONE goot reason I NEVER trade in any of my older clubs, especially drivers. ALL of my clubs have after market high end shafts, shafts that cost MORE then the trade-in value for the driver. Same goes for most used irons. Good True Temper shafts can cost from $12 to $35 PER shaft, so when they tell me a set of used irons are only worth $100 or less, I figure the shafts in those clubs are worth MORE than that. A few years ago I picked up a Barely used set for custom made Forged irons at a club swap for $200. 4 iron thru PW. ONLY club that had any sign of wear was the 7 iron, all the rest looked like NEW. The shafts alone sell for $35 EACH, Forged heads sold for the same $35 EACH. And the grips were like new also. I fugure the Components alone would have cost me around $525 by themeselves. I figure another $5 for epoxy, grip tape and ferrules to assemble the parts and they were worth MORE than the $200 I paid for them used but in like new condition. My best guess would be the person that purchased them NEW paid over $1000 for them to be custom built. That is the ONLY way anyone can buy this set of irons, custom made.